My name is Nick and i have written this dotcomsecrets review so you can decide if this book is right for you. I read a lot of marketing books so whenever I pick up a book like this I can be skeptical! As you can see from the picture my book is a little worn, but that’s because it’s well traveled. I actually finished reading the book sitting by the side of a pool in Mexico, I don’t know about you but when I’m away I love to cram in as much reading as possible! I decided to purchase dotcom secrets about six months ago whilst following the advice of several well respected entrepreneurial blogs. When I first saw the book I thought it would be one of those books written to massage the ego of the author, I’ll hold my hands up, I was wrong! Now, this dotcomsecrets review is going to talk through the different sections of the book whilst sharing some of the most important takeaways. The book was written by expert digital marketer, Russell Brunson, creator of clickfunnels. If you aren’t sure what click funnel is, I have written another article to answer the question, What is a click funnel? So, Dotcomsecrets is referred to as the underground playbook for growing your company online, having read the book I think that this is a fitting tag line. Lets dive in to the meat and bones of the book itself. So first off the book is not about getting more traffic or increasing conversions, it’s not about sorting individual issues with your business or website, this book goes way beyond that. Russell shows you the exact processes, funnels and scripts they have used to scale companies online, he even provides you with ready made email templates that you can adapt and use for your business. Here are a couple of my favorite bits. Russell Brunson started his first online company whilst in college, within twelve months of graduation he had made his millionth dollar selling little products he’d created. He has spent over a decade starting and scaling companies online, the book shows you what he has learnt from hundreds of millions of website visitors and it’s all laid out into simple processes. People often wonder why they aren’t making any sales. Quite often businesses will go straight for the sale, you see it all the time! Let’s say a dentist wants to increase the sale of his retainers, some dentists might advertise the retainer with a small discount and wait for the sales to come in. Although the above method may work for some, it is nothing in comparison to the methods Dotcomsecrets teaches. One of the most important takeaways from this dotcomsecrets review is the significance of a “Value Ladder”. Here is an example of how the dentist could use one of these to his advantage. Let’s say the dentist decided to offer free teeth cleaning, he would advertise this to the masses. Of course, this sort of offer always promotes a lot of attention, by offering something of value for free he is opening up a world of opportunity! This is the start of his value ladder. To remedy this issue he will offer a teeth whitening package, which of course he charges for, at this stage the customer has gone up the first two steps of the value ladder. 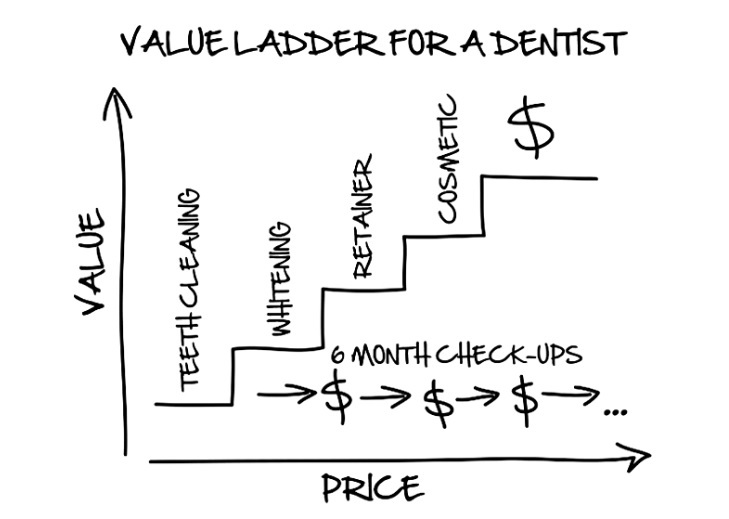 The customer may want slightly straighter teeth, in which case his retainer service will remedy the solution nicely, this will move us up another step on the value ladder. At the top of the value ladder the dentist may offer cosmetic surgery, again there will be people that are interested in this service. The dentist might even choose to offer a continuity program, where by the customer pays a monthly subscription to save money on other services. By reading through this process I’m sure you are starting to see some of the value this book offers, the diagram below shows an overview of the value ladder used in this example. We are now moving on to section two of dotcomsecrets, it’s a useful chapter and it contains three of Russell’s marketing secrets, the majority of this section is built around email marketing tactics. I’m not going to go into full detail on each of these points, I don’t want to spoil the book for you so I’ll give you a brief overview of each. The Soap Opera Sequence provides you with a ready made email sequence and explains why each part is so powerful. Having been on a number of Russell’s email list’s I can tell you that he definitely uses this exact process within his business model. This section of the book provides real value to anybody interested in growing an email list. The Daily Seinfeld Sequence is another useful section, it provides you with more incredible email templates that you can adapt and use for your own business. This method talks through the importance of sending regular emails to your list. Using this exact method Russell emails some of his lists every day. 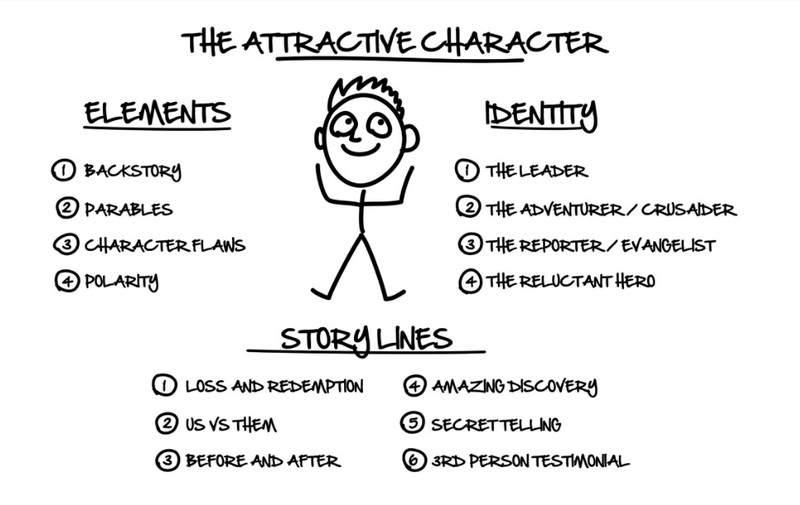 The attractive character section is my favorite takeaway from this section, it talks about the power of building an attractive character (AC) for you and your business. From a marketing perspective a business with a likable, relatable character can be an incredibly powerful tool. If you don’t have a back story that relates to your product/ service you might want to think about how you can add this into your business. If you don’t have a backstory to use, that’s ok you can use somebody else’s. “One of the reasons that Subway does so well is because it focuses marketing tactics around an attractive character. People trying to lose weight can relate to Jared. They understood his backstory, and they wanted to be like him. If this guy could lose all this weight by eating Subway twice a day, then they can too. Jared was the face of subway for almost 15 years before they ended his contract after he made some really bad decisions that landed him in jail. This section of the book stuck with me, I immediately wanted to work out how I could implement an attractive character into the core marketing strategy of my business! Here is an explainer diagram taken from the dotcomsecrets book. This could be the most valuable section of dotcomsecrets, if you understand the principles of a click funnel you will find this section incredibly interesting. It provides actionable techniques to help you replicate and blow your competition out of the park. 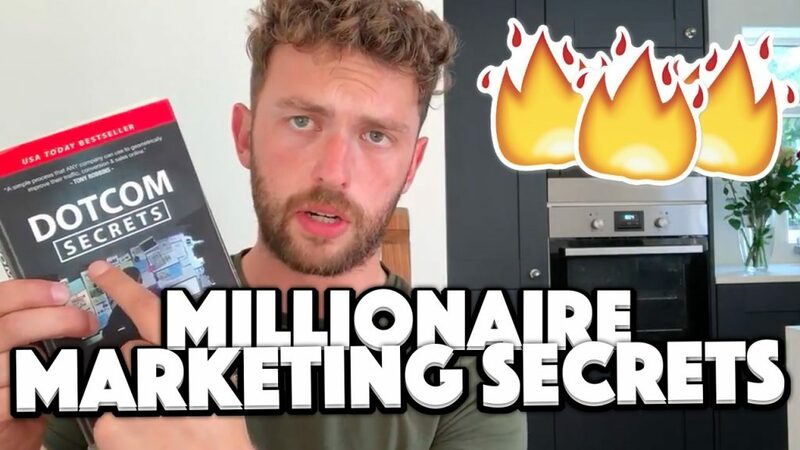 If you aren’t familiar with clickfunnels, I’d recommend you take the time to read and digest this section of the book, alongside this you might want to read our full clickfunnels review. Sounds cool doesn’t it, makes me want to be a funnel hacker!! Anyway…. Russell is a great believer in reverse engineering and you should be too, he talks a lot about it in his books, webinars and events. Within this section of the book he literally shows you how to hack a funnel. With step by step instructions he shows you how to find a successful funnel within your chosen niche. He then goes on to show you how you can figure out exactly where they’re getting their traffic from, pretty cool right. “The internet is full of gurus teaching hundreds of different ways to generate traffic, and it seems like a new tactic or tip pops up every day. At that’s it, learn the basics and take action, that’s where the real journey begins. This is one small piece of value you can take away by reading the book, there is A LOT more inside, if you want to grab a copy for yourself click on one of the links you’ll see throughout this article. Anyway, onto the next part. Now, I don’t know how much you know about Russell Brunson, but he used to be a junk mail addict, that’s right I said junk mail not junk food! He was fascinated with marketing from a young age and I’d imagine that’s one of the reasons why he is the success he is today. Russell would spend a lot of time contacting 1-800 numbers everyday to request free information, it didn’t matter what it was about it was free and he wanted it. You always see free samples and trials everywhere, why? Because they work like hell to get peoples attention. Anyway, my favorite part of this section is the one-hundred-visitor test. You will have to read the book to get all of the juicy content but ill briefly run through the example shown in the book. Russell sends 100 visitors to a website where they can purchase a product, the product is $197. He paid a skilled copywriter and tested different pitches until it was converting well. After all the various tests and tweaks they analysed and found that about 1% of the cold traffic were purchasing the product. For every one hundred visitors he made $197 as well as adding another name to his email list. They then decided to change it up and offer something of value for free, they put some useful information onto a CD and asked for the customer to cover the shipping cost. Once a customer purchased they would immediately upsell them the same $197 product they had before, the results were astounding. On average 8% of the people purchased the free-plus-shipping offer (that’s increased from 1% on the original sales page). Then the magic happened, because this customer had already pulled out their credit card to cover the shipping they had made a commitment towards the concept of buying. Of the people that took up the free plus shipping offer 25% of them bought the upsell offer, meaning they had sold $394 worth of product. This meant that they got 8 new buyers on their list, I think this says a lot about buyer psychology, are you starting to see the power of dotcomsecrets? Maybe instead the question should be, do you see the power of a click funnel? I’m going to finish there as I don’t want to spoil the entire book for you but I can honestly say it’s one of the best marketing books I’ve read. I like the sort of books that you can refer back to and this is definitely one of those. My advice is to read through it, understand it but most importantly put it into action! The book provides you with ready made content and templates you can adapt and use to improve your business. If you get the book, I hope you enjoy it as much as I did! If you want to grab a copy for free (you just pay shipping) you can use one of the links within this article! I’ve also written a review on another of russell books (expert secrets). Trust me, it’s another good one! If you’d like to read the review click here. PS Some of the links included in this article are affiliate links, meaning if you make a purchase I will make a small commission at no additional cost to you.